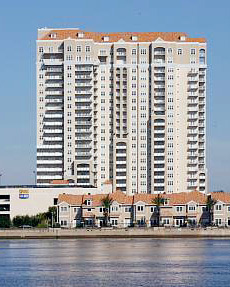 Berkman Plaza condominiums in Jacksonville, Florida. Every great city has a coming-of-age. A renaissance, when spectacular advances in culture, arts, business and lifestyles reach a pinnacle. Here in Downtown Jacksonville, an area in the midst of such historic revitalization, is an extraordinary new lifestyle; one unlike any before it in Northeast Florida. 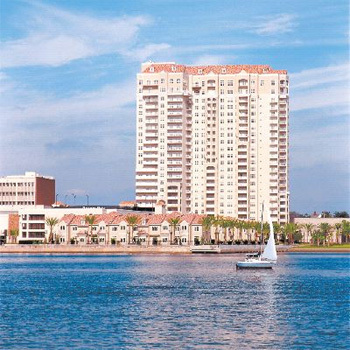 Berkman Plaza is a luxury riverfront complex located on the bank of St. Johns River in downtown Jacksonville. This magnificent 22-story, high-rise tower offers the ultimate combination of deluxe resort living and an ideal setting in the heart of a thriving new urban center. Here, residents are surrounded in luxury and year-round activities, including swimming, sailing, marina, fitness center, spa, salon, 24-hour concierge service, wine tasting room with private wine lockers, indoor squash court, tennis, and pet park. Business center and meeting facilities are also available to residents for business meetings. While The Plaza's exceptional architecture and grand common areas make an indelible first impression, its luxurious interiors and spectacular views are even more breathtaking. The Plaza boasts 22 floors with 206 units of one-, two-, and three-bedrooms. Choose from 11 floor plans. Berkman townhomes are also available. Residents are able to choose from an incredible selection of both standard and upgrade finishes to customize their homes, to reflect their individual tastes. Selections range from the traditional to the contemporary. Homeowners Association includes amenities, high-speed Internet access, intrusion alarms, satellite TV, liability insurance, water, sewage, garbage, landscaping & grounds maintenance, exterior maintenance, and 24-hour concierge services such as controlled access with assigned covered parking, dry cleaning, grocery service, car detailing on site, sign for packages, housekeeping services and tickets for special events. Berkman Plaza 2 pre-construction is now available. Call me today and I'll represent you and arrange a tour of these luxury condos.